1. The machine is controlled by double SCM (single chip) system and a large LCD (115*64 mm) in English display. 2. Special and particular intelligence protection take the machine to auto stop to get the protection and display the fail information when the machine fail in temperature control, color mark hunt control and film finish. 3. Four intelligent temperature controllers. When the heating part or testing part fail to take the sealing temperature over 15 degree of the setting temperature, the machine will stop and display “heat over”. So you can make the wastage to the least. 4. The bag length is controlled by electronic photo switch. The bag length will be cut accurately. When the photo errs, the machine will stop and display “photo errs”. 5. When the packaging film is empty or broken, the machine will stop and display “film end”. 6. The intelligent counter: you can set the counter to a data you need, the machine will stop and take alarm when reach the data you set. 7. The working is stable, easy to use, high yield and low wastage. 1. 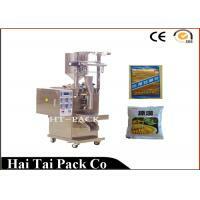 Receiving 30% down payment, we arrange the production of the specific machine. 2. Production cycle is about 25 work days. 3. After the production finished, we notify customer to pay the 70% commodity price and then we deliver the goods. 4. Transit time to port of loading is about 15 days. 8. Free new production techniques and formulas.